“Rollin down the street, smokin indo, sippin on gin and juice/ Laid back (with my mind on my money and my money on my mind).” — Snoop Doggy Dogg. Nov. 23, 1993. 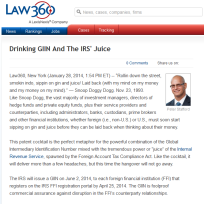 Like Snoop Dogg, the vast majority of investment managers, directors of hedge funds and private equity funds, plus their service providers and counterparties, including administrators, banks, custodians, prime brokers and other financial institutions, whether foreign (i.e., non-U.S.) or U.S., must soon start sipping on gin and juice before they can be laid back when thinking about their money. Read the rest here.